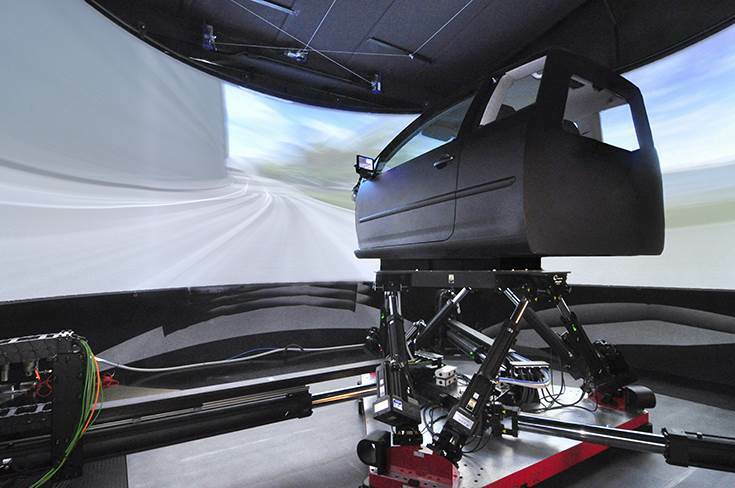 IDIADA's dynamic driving simulator, the new DiM250 from VI-Grade, is capable of generating longitudinal, transversal and rotational acceleration forces up to 2.5 g.
Applus IDIADA has the expertise to design and develop test facilities and proving ground for CAV. Applus IDIADA, the multinational company, which provides design, engineering, testing and homologation services to the automotive industry, has a strong presence at SIAT Expo 2019 (Stall No. 167). IDIADA is presenting its comprehensive automotive testing and engineering capabilities ranging from passive safety, active safety, vehicle dynamics and body development. In particular, IDIADA's focus is on the impact of connected and automated vehicles in the different fields of vehicle dynamics and homologation. IDIADA's dynamic driving simulator, the new DiM250 from VI-Grade, is capable of generating longitudinal, transversal and rotational acceleration forces up to 2.5 g, characterised by extremely low latency and high-frequency, replicating a wide range of vehicle dynamics manoeuvres and reproducing complex driving situations. Vehicle Dynamics and Autonomous Driving: The automotive industry is facing major challenges related to autonomous driving, platform commonality and short development time. The advent of autonomously driven vehicles will require a massive change of perspective for vehicle dynamics experts. Existing attributes will be heavily modified in order to emphasise occupants’ comfort in terms of road isolation and driving dynamics. On the other hand, trajectory planning and control must take into account the principles of vehicle dynamics in order to deliver a confident, comfortable and safe driving experience. Further, platform commonality requires an accurate plan of the vehicle dynamics attributes across a vast range of products and must be supported by efficient tools for target cascading in order to analyse early on which parts of the chassis can be carried across different products and which parts must be designed specifically. Finally, the need to reduce development time and the use of prototypes can only be met by increasingly introducing virtual simulation. Therefore, vehicle dynamics models must be predictive and valid in a much wider range of domains than in the past. This means that not only handling must be simulated but also comfort, up to high frequencies, and steering. The integration of electronic chassis control systems further complicates this scenario. Innovative tools such as advanced tyre models, virtual road models and driving simulators are among the key elements required to develop and validate the driving dynamics in a fully virtual environment. Homologation and Automated Driving (AD): Many manufacturers are developing new models with cutting-edge functionalities focused on AD, which are not included in the scope of the current regulatory framework. Along with manufacturers demonstrating their know-how and expertise about AD, their willingness to sell these models is accelerating the rule-making system. However, policy makers and regulatory bodies are pushing their boundaries at all levels (national and international) in order to introduce modifications in existing regulations. These regulations will enable the introduction of these new functionalities into the market. The implementation of a clear and harmonised regulatory framework and approval process is vital without decreasing safety and security standards. The latest amendments of UN Regulation no. 79 related to steering equipment or the creation of new standards such as the ISO 21448 regarding Safety of the Intended Functionality (SOTIF) are examples of recent efforts from the regulatory bodies to achieve this goal. Applus IDIADA says it has a thorough understanding of the regulatory framework regarding automated driving, the forthcoming amendments and new standards and the different challenges that the European Commission (EC)/United Nations Economic Commission for Europe (UNECE) face. The company has also analysed the different approaches to be considered by the international regulatory bodies. The company offers a global overview of this change of paradigm to all players across users, manufacturers, authorities of approval and technical services. These will be the key focus areas of the senior company delegates attending the event.